← Hello Kitty House- yes please! This evening I typed Hello Kitty Tattoos into Google within 6 seconds 17,700,000 results were found. Tattoos are such a fascinating concept; they are such a personal expression and can represent so much to the owner as well as people looking at the tattoo. I have set up searches on my twitter feed for Hello Kitty, a recurring topic is the idea of a Hello Kitty tattoo, it seems to divide people, some people think it’s a cool idea; the image is cute, feminine a representation of Kawaii. Other people can’t stand the idea; having her motif, a corporate logo or something so cartoonish just seems so wrong to them. Looking through the pictures I have found on Google this evening I was amazed by all the different designs; some of the tattoos are quite cute and keep to the original motif, others change the expression of Hello Kitty’s face and change the style to quite a punky rocky image. Hello Kitty tattoo Lovers– do you have her image tattooed on you or would you like one? Where if your tattoo? Why did you pick HelloKitty for a tattoo? What does the tattoo mean to you and what message are you trying to give out? 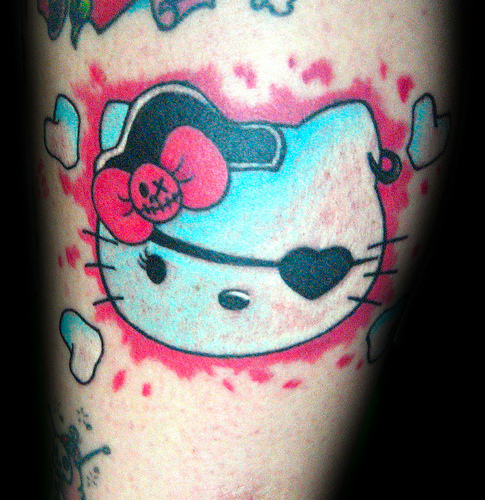 Hello Kitty tattoo Haters– why do you hate Hello Kitty tattoos? What do they mean or represent to you? Do you hate the brand in general or just the idea of a tattoo? Are you a tattoo artist– have you ever tattooed someone with a Hello Kitty motif? What was the design? What did it represent to you? Do you like the image? It would be fantastic to here from anyone, either leave a comment below or email me at HelloKittyDevotee@gmail.com. If you could provide a little background info about yourself and maybe a picture if you have a Hello Kitty tattoo I’d be very grateful. This entry was posted in Hello Kitty, Kawaii, Tattoo and tagged hello kitty, Hello Kitty Haters, Hello Kitty Lovers, Image, Motif, representation, Tattoo. Bookmark the permalink. I have been trying to decide on a second tattoo for a couple of years now and can never decide what I want or where but now I have read this it has got me thinking and I am going to look at the Hello Kitty designs out there as I am really keen to have it as a tattoo. It will be different (I like being different) and fun – will let you know if and when I decide to have one but I am very keen now.